Interactive Map: What Is Your County Spending On Marijuana Law Enforcement? Washington state’s war on marijuana has cost taxpayers hundreds of millions of dollars over the last decade. Every one of Washington’s 39 counties has spent millions of dollars enforcing these laws. A new interactive map created by the ACLU of Washington (which can be accessed below), estimates how much each county has spent on adult marijuana law enforcement between the years 2000-2010. It also shows where this money goes in the criminal justice system. Millions are spent arresting, prosecuting, defending, convicting, jailing, and supervising adults for marijuana offenses. At a time when local government budgets are being squeezed thin, scarce public safety resources should be spent in a more productive manner, such as going after violent criminals. 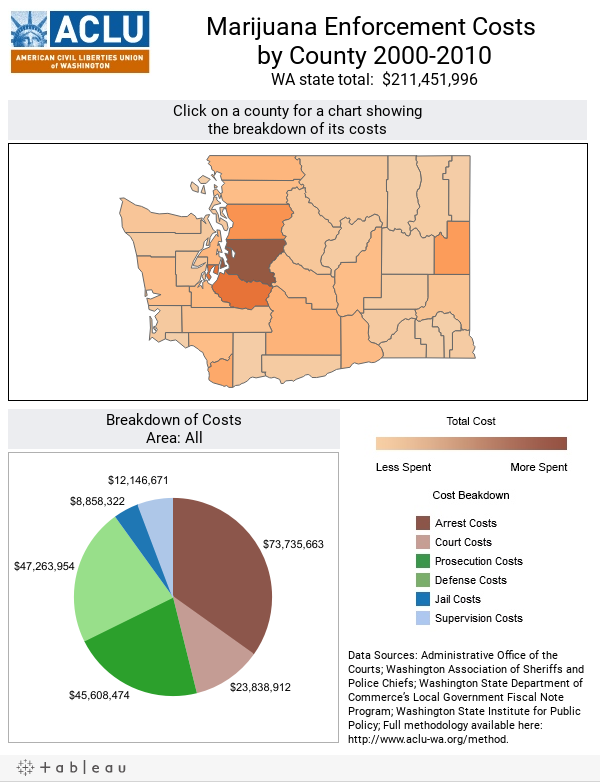 Please take a minute to see how much your county has spent on marijuana law enforcement and stay tuned for additional visualizations covering Washington's war on marijuana. This embed will serve content from public.tableausoftware.com.